My tricorder says Pikachu is…there. 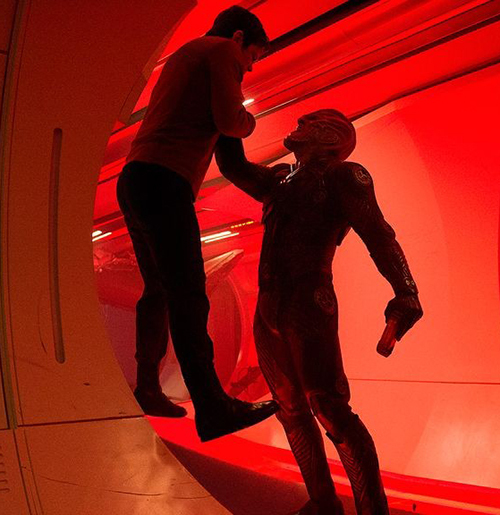 Star Trek Beyond pulls off an impressive balancing act. It’s at once a spectacle-filled modern blockbuster, in line with the first two films of the 21st century reboot, and a throwback to the sci-fi storylines of the original TV show from the 1960s. 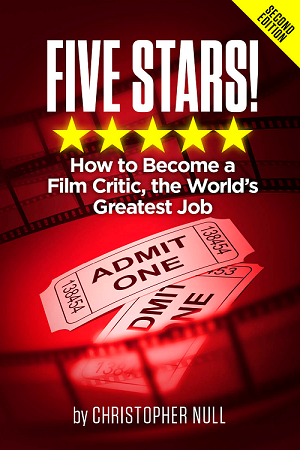 The mixture mostly works with director Justin Lin – a vet of four Fast and Furious films, beaming over some of the ridiculous pleasures from that franchise and a strong cast indulging in the levity while also creating poignant character moments. The meta brashness starts early when James T. Kirk (Chris Pine) opines in his captain’s log that, “Things have started to feel…episodic.” Three years into a five-year mission to boldly go where no one has gone before the captain of the Starship Enterprise has grown a bit weary, but when a new adventure presents itself he’s eager to lead his team, with that signature swagger, into the great unknown. And into what turns out to be an extended, lively, action-infused Roddenberry Star Trek episode. 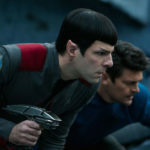 A call for help takes the Enterprise and her crew – Kirk, Spock (Zachary Quinto), Bones McCoy (Karl Urban), Scotty (Simon Pegg), Sulu (John Cho), Uhura (Zoe Saldana), and Chekov (the late Anton Yelchin) – through a nebula and into the uncharted space… beyond. The ship is promptly attacked by Krall (Idris Elba), who looks like the Louis Gossett Jr. alien from Enemy Mine crossbred with a cobra, and his swarming, insect-like fleet of vessels. He’s hunting down a MacGuffin for dastardly purposes. The Starfleet officers are left marooned and split up on an alien planet, and it’s up to the canonical characters, and new ally Jaylah (Sofia Boutella), to stop the evil plan. The Enterprise has been through a lot in its half-century in pop culture, being destroyed often, and Star Trek Beyond gives the ship its biggest beating yet. The initial blitzkrieg is fierce and chaotic, with several Redshirts meeting their demise. It’s an exhilarating sequence, but a little dark. Literally dark. Lin stages a few big sequences at night and/or in shadows, and while some of the dimness could be attributed to lackluster 3D projection, the action gets occasionally murky and difficult to follow. The brighter set pieces, including a huge gyroscopic Federation outpost called Yorktown, are much more interesting and fun. Even more pleasurable are small moments with the crew. The script was written by Pegg and Doug Jung and it’s clear they have affinity for the style and themes of classic Trek, augmenting them with contemporary ideas. There’s an easy familiarity with people and relationships, which is felt without being belabored. Pine continues to be a great Kirk, capturing the characteristic arrogance without doing a William Shatner impression and, this time around, adding nuance with sporadic space-induced fatigue. Quinto and Urban nail the respectfully contentious friendship of Spock and Bones. 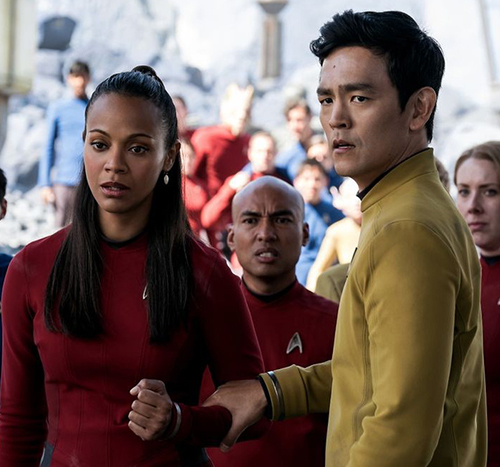 Spock and Uhura have a history that’s present and not overwritten, and a few quick seconds give the (by now much-publicized) revelation that Sulu is gay. This development isn’t treated like a huge reveal; it just is, and it fits into the alternate timeline established in the series reset. I mean, it’s Stardate 2260, who cares about the sexual preference of a Starfleet helmsman? Fresh characters perpetuate the old meets new aesthetic. Jaylah has a simple black-and-white design that harkens back to the (19)60s, while the accomplished martial artistry of Boutella meets current action standards. She’s also able to emote through the makeup and crafts an impressive heroine. Krall is a bad guy with a goal, though in what’s become a common problem in this new series of films, he’s not a particularly memorable adversary and his motives are clumsily exposed. No matter how much Elba snarls, there’s nothing very interesting for him to snarl about. Antagonist issues aside, Star Trek Beyond uses the strength of established characters and a breezy pace to sustain the adventure. There’s a pensive yet playful vibe that melds science with bombast, providing something of interest for any generation of Trekkie.